Michael R. Collings is an author and poet and was a professor of creative writing and literature at Pepperdine University. He was Poet in Residence at Pepperdine’s Seaver College from 1997 to 2000. He published several poetry and fiction collections (Naked to the Sun; Dark Transformations; The Nephiad: An Epic Poem in XII Books; All Calm, All Bright: Christmas Offerings; In the Void: Poems of Science Fiction, Myth and Fantasy, & Horror; We Means Man and Other Tales of Wonder and Terror) and has penned several novels (The House Beyond the Hill; Singer of Lies; The Slab; Static! ; Shadow Valley; and Writing Darkness). 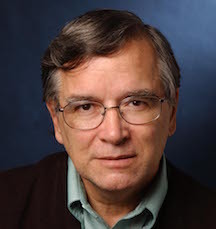 He has written several literary critiques and bibliographies of the works of Orson Scott Card, Stephen King, Peter Straub, Dean Koontz, C. S. Lewis, Brian W. Aldiss, and Piers Anthony. Collings was born on October 29, 1947, in Rupert, Idaho. He received an associate’s degree from Bakersfield College, a bachelor’s degree in English from Whittier College, and a master’s degree in English and a PhD in English literature, both from the University of California, Riverside. His specialty is Milton and The Renaissance. Collings writes in the horror genre with books such as Windows into Hell Anthology and Chain of Evil. In an interview with the Deseret News, Collings said, “The basics of horror are that there are things out there that are simply evil. … Horror is perhaps the most moral genre being written right now because there are causes and consequences. You make a choice, and there is a consequence.” Collings has served as Guest, Special Guest, and Guest of Honor at a number of conventions, professional as well as fan-oriented, including three-time Academic GoH at the World HorrorCon. He has been nominated for the Bram Stoker Award (Horror Writers Association) for nonfiction and for poetry. He is a member of The Church of Jesus Christ of Latter-day Saints and lives in Idaho with his wife, Judi. His son, Michaelbrent Collings is also a writer. This page was last edited on 24 November 2017, at 23:01.